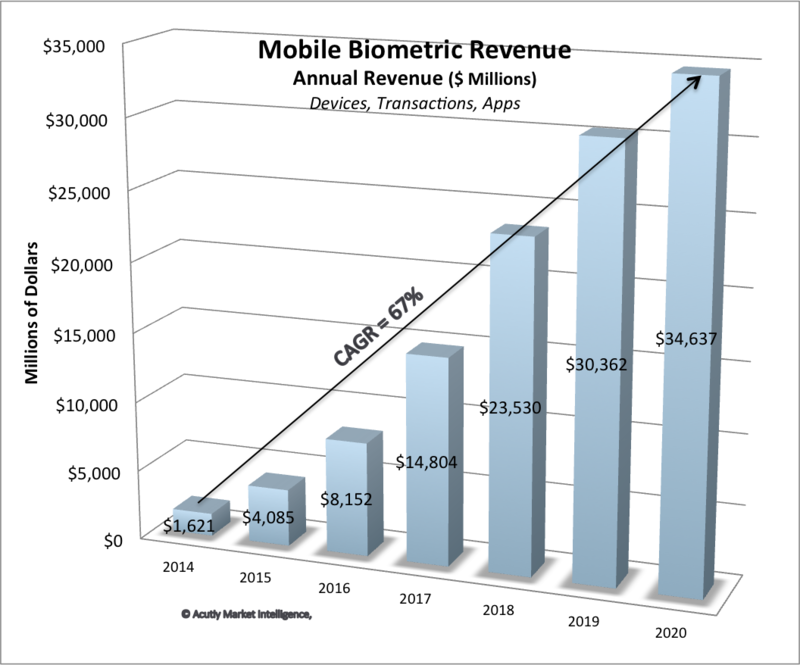 Acuity Market Intelligence’s latest research “The Global Biometrics and Mobility Report: The Convergence of Commerce and Privacy” forecasts that between 2014 and 2020 nearly 12.9 billion mobile biometric apps will be downloaded to smart mobile devices by 2.2 billion mobile biometric users. 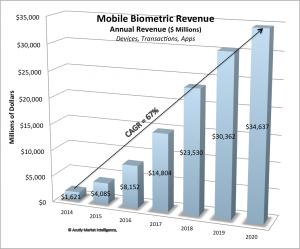 The mobile biometrics market is projected to generate more than $67.9 billion in total app revenue during the seven-year forecast period. Mobile biometric apps are downloadable, software applications that enable biometric authentication capabilities on smart devices. They can operate independently or can leverage onboard or embedded biometrics, or other biometric apps that have been previously downloaded. Biometric apps are purchased by the user or provided free of charge by vendors, merchants, or service providers. Acuity projects that biometric app annual revenue will increase at a compound annual growth rate of 148% over the forecast period from less than $100 million in 2014 to more than $21.7 billion in 2020. Acuity reports that more than 5.4 billion biometric smart device apps will be downloaded in 2020, up from 6.5 million in 2014. Acuity also reports that there will be 4.8 billion biometric mobile devices in circulation in 2020, most containing multiple biometric apps from multiple sources. “As biometrics become standard on smart mobile devices and consumers are increasingly accustomed to relying on biometric security, continually updated, highly secure biometric apps will be downloaded to ensure the highest mobile security standards are maintained,” says Maxine Most, Acuity Market Intelligence Principal and author of the report. “The Global Biometrics and Mobility Report: The Convergence of Commerce and Privacy” offers detailed forecasts and market analysis for the consumer mobile biometric market and includes 200+ data tables and charts. The report can be previewed and purchased here. HYPR Biometric Security released its Tokenization SDK to the public for third party integration. The SDK is designed to help any size organization to implement advanced identity management in any application. The kit supports all compatible biometric devices like mobile phones and tablets, with built-in support for the many ways biometric sensors can be utilized for authentication: fingerprint scanning, facial or voice recognition, and the like. The HYPR SDK includes mobile and desktop client libraries as well as server side software, to enable end-to-end biometric tokenization. The HYPR platform enables third parties to authenticate users without ever transmitting biometric data across the Internet. That data is kept securely offline, rather than it being warehoused in a central repository that is a prime target for hackers of wholesale data. The HYPR SDK is in deployment across a number of banks, which are implementing biometric security solutions for use cases ranging from internal employee authentication to their consumer-facing mobile apps. Mobile wallets and even Bitcoin platforms are integrating HYPR to prevent payment fraud across their user base. A demo of the kit can be viewed below. Sonavation, a provider of ultrasound biometric technology in identification and authentication, announced it has reached an industry milestone by successfully developing and bonding an ultrasound biometric sensor compatible with Corning Gorilla Glass, providing a high-resolution 3D fingerprint image. Corning Gorilla Glass is utilized on nearly four billion devices and used by more than 40 major brands worldwide. This advancement in authentication technology will enable manufacturers to integrate a 3D ultrasound biometric sensor into a smartphone or IoT device making it capable of capturing fingerprint data into the ridges and valleys.